Allen Carr's Easyway is the most successful self-help stop-smoking method of all time. It has helped millions of smokers from all over the world to quit. 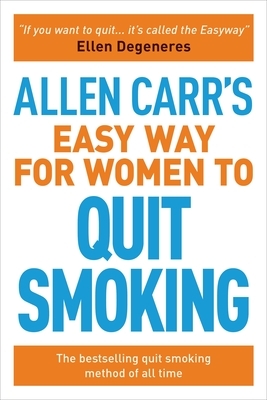 In the Easy Way for Women to Stop Smoking Allen Carr addresses the difficulties that women smokers face when trying to quit, and shows how his technique successfully resolves them. Allen's unique method removes the feeling of deprivation and works without using willpower. This book can enable any woman to escape the nicotine trap easily and painlessly without putting on weight. His books have sold over 15 million copies worldwide, and read by an estimated 40 million people, while countless more have been helped to quit through his network of clinics. This phenomenal success has been achieved not through advertising or marketing but through the personal recommendations of the ex-smokers who've quit with the method. Allen Carr's Easyway has spread all over the world for one reason alone: BECAUSE IT WORKS. "Allen Carr's Easy Way to Stop Smoking Program achieved for me a thing that I thought was not possible - to give up a thirty-year smoking habit literally overnight. It was nothing short of a miracle." "It's the only method that works. Thank you "
Allen Carr (1934-2006) was a chain-smoker for over 30 years. In 1983, after countless failed attempts to quit, he went from 100 cigarettes a day to zero without suffering withdrawal pangs, without using willpower and without putting on weight. He realised that he had discovered what the world had been waiting for - the Easy Way to Stop Smoking, and embarked on a mission to help cure the world's smokers.